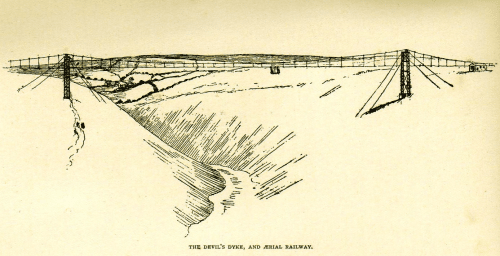 As the illustrations on this page attest, there was once an aerial cableway across the chasm that has become known as the Devil’s Dyke. 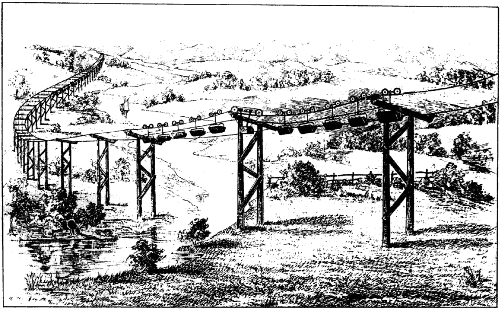 An early representation of it is a rather primitive sketch that appears in a book by William Axon that was published in 1897, some three years after the cableway opened. The caption to Axon’s drawing refers to an ‘aerial railway’ rather than an ‘aerial cableway’ which is the term that Clark (1976) uses. Many other terms are used in the literature on such systems: ‘aerial ropeway’, ‘cable car system’, ‘overhead tramway’, ‘passenger ropeway’, ‘suspension railway’, ‘wire rope tramway’, and so on. However, since Clark’s booklet is the best available published source on the Dyke installation, his terminology is adopted here. 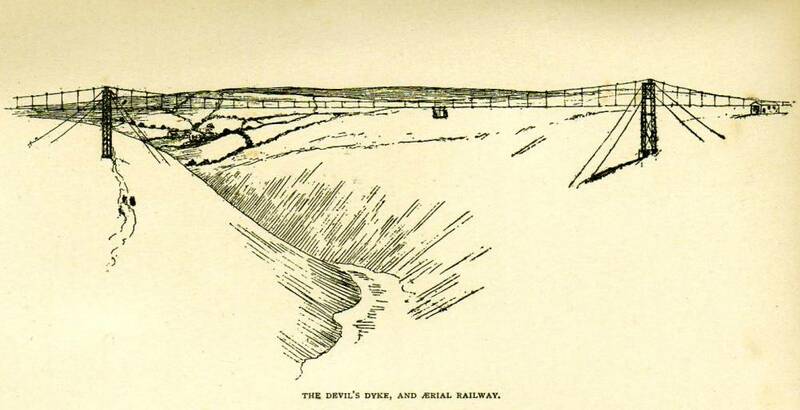 The Dyke Railway had begun services in 1887 and James Henry Hubbard, the most energetic Dyke entrepreneur, had bought the hotel and the estate in 1892 and immediately set about exploiting the increase in visitors that the opening of the railway permitted. Thus, on a single public holiday in 1893, he was able to boast of 30,000. The aerial cableway was but one of Hubbard’s ambitious portfolio of attractions designed to boost the visitor numbers yet further. It was first mooted in 1893 and constructed in 1894. 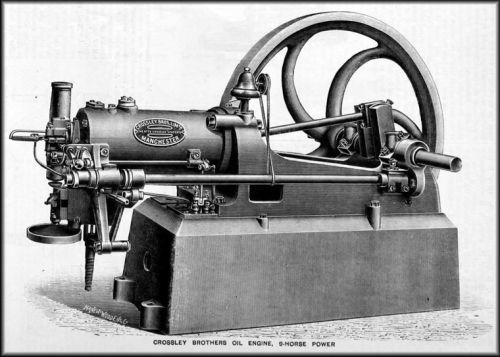 It was designed by William Brewer, a civil engineer and inventor. Looking across the Dyke from north to south: note the station to the left and the rectangular gap in the pylons through which the cars and the endless cable passed — a key feature of Brewer’s design. There are three useful ways to evaluate the cableway: (i) as a magnet for day-trippers to the Dyke; (ii) as a public transport link between Poynings and Brighton; and (iii) as an engineering demonstration. These will be considered in turn. Attracting day-trippers to the Dyke? Several writers have suggested that the cableway performed a significant transport function. A Poynings resident could take the steep grade railway to the top of the iron age fort, walk a short distance to the cableway, cross the Dyke, alight, walk a slightly longer distance to the Dyke Station, and catch a train for Brighton. And vice versa, of course. It sounds rather plausible. It even looks plausible when you inspect a 2D map of the locale: if you draw a straight line between the steep grade station and the Dyke station then that part of the line that crosses the Dyke exactly coincides with the route of the cableway. However if you look at a contour map, or simply walk the site, then the plausibility evaporates. The Dyke is not the Grand Canyon. You can just walk round the western end and bypass it. You will end up walking about an extra 500 yards but you will have avoided queuing to buy a ticket, waiting for a cableway car to depart, and spending over two minutes in the air in an open cage enjoying the wind along with the views. Assuming a normal walking pace, getting from the steep grade station to the Dyke Station would have taken at least 9.5 minutes if you used the cableway and at most 12.5 minutes if you simply skirted the Dyke and walked the entire distance. The cableway could not be justified on public transport grounds. A significant engineering demonstration project? As we have seen, there is no reason to suppose that the aerial cableway proved to be a great success as a theme park ride. 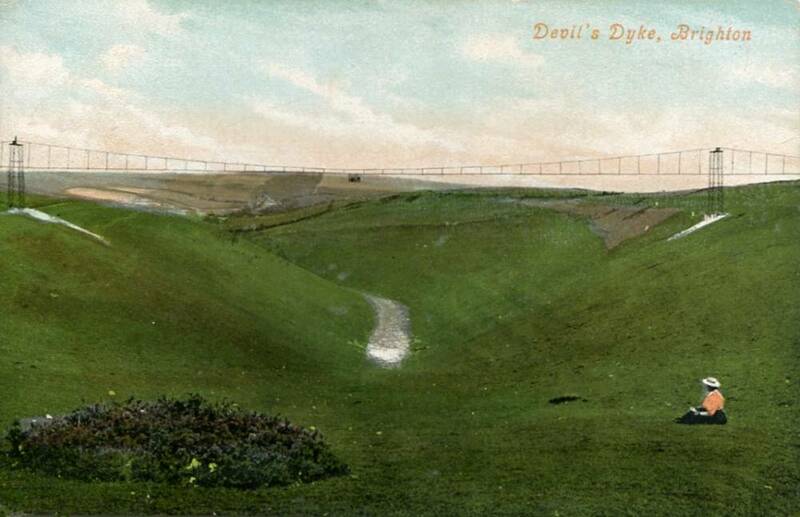 Nor did it make any significant contribution to public transport on the Downs. But Brewer was an engineer and his cableway was a highly innovative piece of engineering. To substantiate this, we need to delve into the history of cableways. Aerial ropeways have been in use for industrial and military purposes for hundreds of years and must date back to not long after the invention of rope itself. However, the modern aerial cableway only became possible after the invention of sophisticated steel cables in the latter half of the nineteenth century. Brewer did not invent the modern cableway — such systems were in use for moving ore, coal, and similar materials prior to 1894. 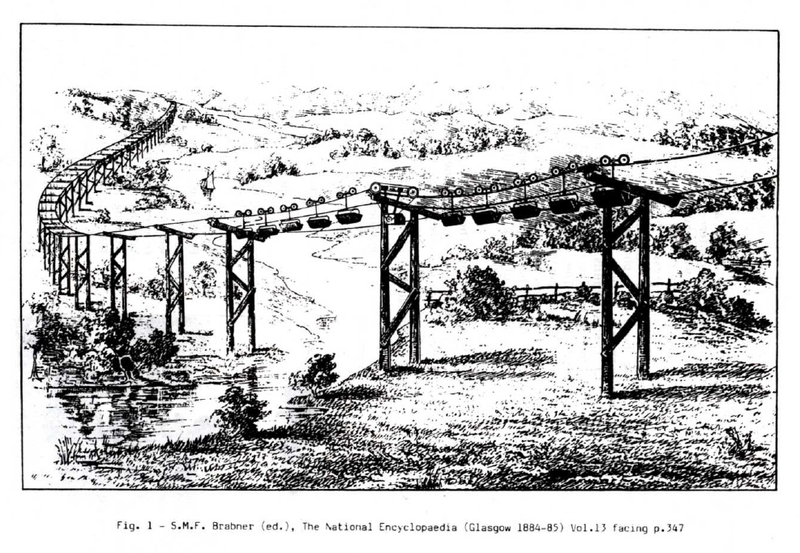 One such system, the Telpher Line, came into operation in Glynde in 1885 and was used to move bricks from a clay pit over a marsh to a goods siding at the railway station (Pope 1987). Most industrial cableways of the period used a single cable both to suspend the car and to pull it. Those uses conflict. You want a strong (hence thick and stiff) cable to carry the load but a flexible (hence thin and light) cable to tow the car. 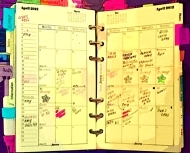 A single-cable system normally had to involve a compromise. In the case of the Telpher Line, no compromise was required since it dispensed with the towing cable altogether: cars had their own electric motors for locomotion. Given the proximity of Glynde, it is perhaps unsurprising that it was the Telpher Cable and Cliff Railway Syndicate Ltd. that acted as the promoter of Brewer’s cableway in 1893. Unlike the Telpher Line, the latter was a two cable system: a relatively thick one was hung like a suspension bridge to act as a rail and a thin one was used to tow the cars*. Another novel feature of the Brewer design was the centrally located rail cable enabled by the holes in the pylons through which the cars passed. Aerial cableways, even to this day, much more commonly have the rail cable to one side or on both sides of the pylons (as at Glynde). And that means that the centre of gravity of the cars is not aligned with that of the pylons. The off-centre load entails using stronger pylons. Side-hung rail cables also make it harder to employ guy ropes on the pylons lest the cars foul them. Clark says that Brewer’s aerial cableway was “the first of its type ever built” (page 47) but it is not really clear what this claim amounts to. Clark may be referring to the characteristics just noted. Or he may be referring to the fact that Brewer’s cableway was designed to carry passengers not freight. One of Hubbard’s promotional posters claimed that his ‘Great Cable Railway’ was the only one in Britain. If true, that would suggest that it was also the first passenger cableway in Britain. Talbot claims that the first passenger cableway in the world was built in Hong Kong by a British firm but fails to provide a date (1914, page 35). Passenger transport imposes different design constraints than freight, most obviously in respect of safety. If a car full of coal becomes detached and drops into a chasm, few beyond the mining site will take any interest in the matter and the economic consequences are slight. A less obvious set of constraints concerns ingress and egress: coal can be dropped into a car from a chute and can leave it through a trap in the bottom. Humans prefer something a little more dignified. Further, cars full of coal or bricks do not get seasick or complain about vibration and noise. Cars full of humans do. From what we know, Brewer’s cableway provided solutions to these various constraints. The most obvious problem with Brewer’s creation was that it was in the wrong place. It had no real transport function crossing the Dyke. If it had been thrown across the Avon Gorge or the River Severn, say, then it might still be in use today. And William Brewer might have joined at least the second tier in the pantheon of Victorian era engineers. Today, all that is left of William Brewer’s magnificent piece of engineering are two ugly chunks of concrete positioned either side of the Dyke. No visitor unfamiliar with the history would guess that they once supported a graceful iron and steel suspension bridge. The remains of the foundations of the northern pylon: a relic that only an industrial historian with a speciality in Victorian concrete could love. 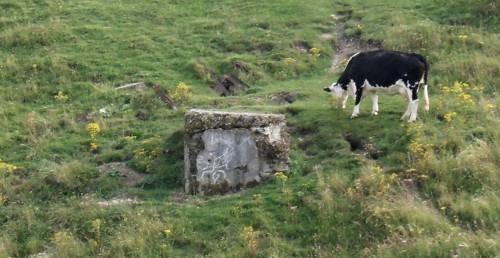 A bovine archaeologist pursuing field work in the area around what is left of the foundations of the southern pylon. *In reality there were more than two cables involved: the catenary at the top, two for the rails (one in each direction) the cable loop used for towing the cars, and additional cables to brace the pylons. M.I. Pope (1987) Mineral transport by the Telpher system – the pioneering work of Prof. H.C.F. 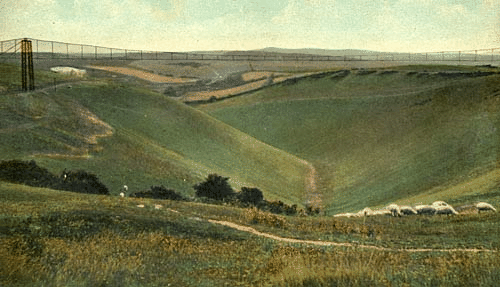 Fleeming-Jenkin (the story of the Glynde aerial railway). Sussex Industrial History 17, pages 13-19.